Every January, I think of this article about Tamar's beautiful book, An Everlasting Meal. Tara Parker Pope was right--there's no better way to start the year than to commit to cooking more, and better, at home. And for that, there is no better muse than Tamar. When I asked Tamar recently if she had anything new to say about beans, she responded, "Re-reading what I wrote about beans a few years ago I don't have much to add but a bold underline and affirmation that I still do everything I did then, and still feel grateful I know how to. 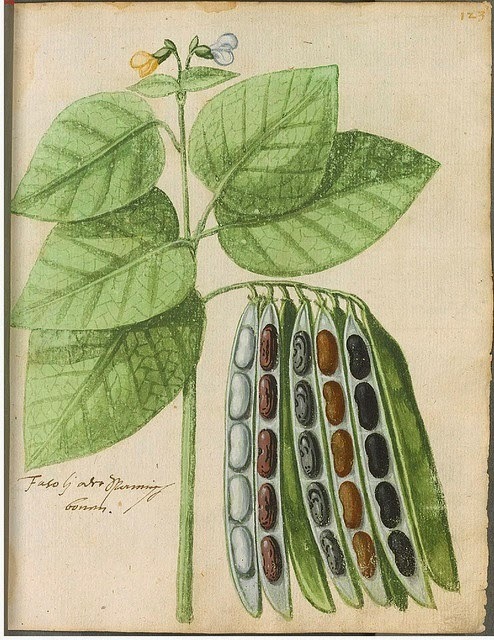 I continue, too, to collect bean anecdote and trivia, feeling every time I do like I am collecting information about my roots, though they are not Tuscan or anthropological or agricultural, but human, and as far as I can tell, humans are meant to eat beans." Here's an excerpt, from the chapter entitled, "How to Live Well:"
Tuscans, though, make the best beans. They are known in Italy as mangiafagioli, or "bean eaters." Tuscans believe that frugality is next to godliness and give the humblest ingredients their finest treatment. Tuscan cooks are extravagant with good olive oil, pressed from dark trees, and with vegetable scraps and Parmesan rinds, which, along with salt and more of that fine oil, make transcendent pots of beans. Those odds and ends are as crucial to pots of beans as fresh water. Your pot will benefit from a piece of carrot, whatever is left of a stalk of celery, half an onion or its skin, a clove of garlic, fibrous leek tops. If you must decide what to save for your chicken pot and what for stock and what for beans, save your fennel scraps with pots of beans in mind. I make notes to myself after meals, and there are enough torn pieces of paper attesting that "The best bean broth has fennel in it!" for it to have become axiomatic. Your pot also wants parsley stems, whole sprigs of thyme, and a bay leaf. It can all be tied into a neat bundle in cheesecloth or with kitchen twine, or it can be left bobbing around, as everything in my bean pot always is. The liquid in a bean pot becomes broth as beans cook in it just as the water in which you boil a piece of meat does. No ounce of the water that goes into a bean pot should be discarded. Tuscan food is based as much on the broth made by the beans on which Tuscans lavish their affection as on the beans themselves. Harold McGee, who writes about the chemistry of food simply, writes that beans make their own sauce. He is right. Their sauce must be well made and it must be kept. Cooking beans is like boiling a chicken or boiling an egg: only their water boils, and only for a brief second. The rest of their cooking is slow and steady. Light the burner under your beans, and as soon as the pot has come to a boil, turn the heat down to just below a simmer. Gray scum will rise to the top of the pot and gather around the edges. Skin it off and discard it. The best instruction I've read for how long to cook beans comes from a collection of recipes called The Best in American Cooking by Clementine Paddleford. The book instructs to "simmer until beans have gorged themselves with fat and water and swelled like the fat boy in his prime." The description is so perfectly illustrative I don't think anyone should write another word on the subject. I don't know who the fat boy is, but I feel I understand his prime perfectly, and it is what I want for my bean. As they cook, beans should look like they're bathing. Their tops should stay under the surface of the liquid, or they will get cracked and leathery, and they shouldn't ever be in so much water that they're swimming. Taste their broth as they cook to make sure it is well seasoned. It should not taste like the pleasant seawater of the pasta pot, but like a sauce or soup. The second good piece of advice from the same book is in one of its recipes for black beans: "Soak beans overnight; drain. Put in pot, cover with water. Add onion, celery, carrot, parsley, salt, and pepper. Simmer until bean skins burst when blown upon, about three hours." This is the only recipe I've ever read that takes the doneness of beans as seriously as it should be taken: a cooked bean is so tender that the mere flutter of your breath should disturb its skin right off. Cool and store your beans in their broth. The exchange of goodness between bean and broth will continue as long as the two are left together, and the broth helps the beans stay tender through chilling, freezing, and warming up again. Those are instructions for cooking all beans. P.S. If you want more Tamar (and I'm not sure why one wouldn't), check out her column in the New York Times Magazine.